The holidays are finally over for the season. You don’t have to rush out and buy presents for a gaggle of relatives. And you can stop taking those expensive trips to the grocery store to load up on enough food for a feast of hungry visitors. Hey, some of you might even be lucky enough to be getting a little bit of cash back from the IRS. So music fans might want to treat themselves to one of the coolest pop culture items on the market —The Beatles Song Charts. Sure, everyone with even limited music knowledge is aware who played what instrument in the iconic band The Beatles. But even though John and George are known for guitar guitar, Paul handled the bass and Ringo sat behind the drums, they each frequently employed their many musical talents to their numerous tunes. Did you know that George picked up the Claves on “And I Love Her”? (Do you even know what claves are?) Or that Ringo provided more cowbell on “I Call Your Name”? 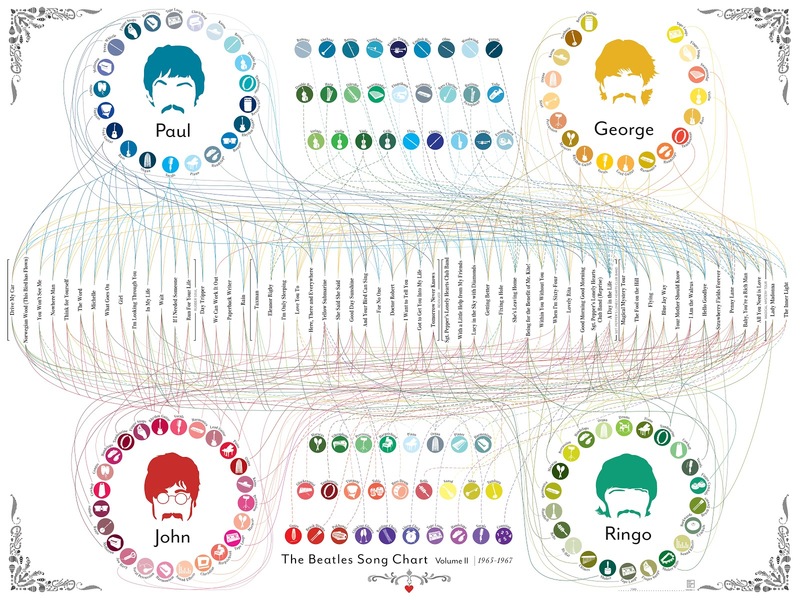 Dividing these details into three separate charts that span the Fab Four’s career, the good people at Pop Chart Lab have created a series that dives deep into all of the great group’s musical minutia. And the posters even track the lads from Liverpool’s evolving hairstyles — via colorful follicle following silhouettes. Volume 1 traces the simpler times during the early years of the band between 1963 and 1965. During that period the Mop Tops played a limited arsenal of standard rock ‘n’ roll instruments on their early albums. So there are limited lines tracing the guitars, drums, bass and controlled accouterment on Please, Please Me, With the Beatles and A Hard Day’s Night. By Volume 2, which covers 1965 to 1967, their efforts exploded. Each member contributed sounds from over twenty different tools of their trade including bongos, Jew’s harps, clavichords and even kazoos — not to mention all the vocals, handclapping and finger snapping that was going on. And the number of guest appearances on additional gear is mindboggling. But it’s Volume 3 that is most impressive — and barely unreadable. As the band hit it’s creative apex on records like The White Album, Abbey Road and Let It Be, it’s nearly impossible to trace the trajectory of each member’s contributions. Reading it’s so overwhelming, it’s no wonder the band broke up. They must have been exhausted. This is the perfect gift for any true Beatles fan — or anyone trying to impress one. To order visit the official Pop Chart Lab website.